President Andrés Manuel López Obrador. Photo: Marco Ugarte, Associated Press. 01/14/19 (written by kheinle) — The Supreme Court (Suprema Corte de Justicia Nacional, SCJN) upheld a law on January 8, 2019, that will limit what members of the public sector and judiciary can earn (Ley de Remuneraciones de los Servidos Públicos). President Andrés Manuel López Obrador (AMLO) publicly supported the bill while he was waiting to take office, which Congress then approved in November 2018. The law results in the reduction of Supreme Court justices’ salaries by 25%. This is part of President López Obrador’s commitment that no public sector worker shall earn more than the president unless in special circumstances. He had previously called the judges’ salaries “offensive,” although their exact salary amounts are unconfirmed. 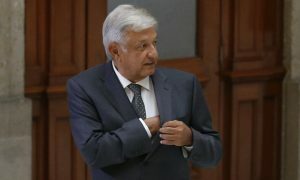 Following the Supreme Court’s decision, President López Obrador remarked that it was “an act of good will” and the judges’ ruling needed to be acknowledged. As the Associated Press reported, the Supreme Court noted that their decision is “part of a new policy of austerity” in line with its recently elected Chief Justice who began at the start of the new year. Justice in Mexico’s 2016 Justiciabarómetro report, “Perspectives on Mexico’s Criminal Justice System: What Do Its Operators Think?” shed light on the disparity between judges’ salaries and that of other judicial system operators. More than 700 judges, prosecutors, and public defenders in 11 states participated in the study, which analyzed respondents’ perceptions on the New Criminal Justice System (Nuevo Sistema de Justicia Penal, NSJP). The NSJP was implemented in 2016. The authors concluded that there is a notable difference in salaries among all judicial system operators. Nearly three in five judges (63%) earned more than $30,000 pesos per month at the time, while a large majority of prosecutors (72%) and public defenders (82%) earned less than $30,000 pesos per month. The authors argued that leveling out the salaries of judicial system operators is important in addressing corruption in Mexico, a systemic challenge felt at all levels of government. The authors recommended that the Mexican government specifically monitor salaries in the judicial sector. This should especially happen in states where survey respondents – including prosecutors and public defenders – expressed serious misgivings about their current rates of pay. Such a recommendation falls in line with President López Obrador’s priorities to focus on corruption, fiscal responsibility, and austerity during his sexenio (2018-2024). In particular, he seeks to decrease governmental expenses; limit the salary of the president, public servants, and the judiciary; and end pensions received by former Mexican presidents. He even cut his presidential income to 40% of what his predecessor, President Enrique Peña Nieto (2012-2018), earned. President López Obrador now takes home $108,000 pesos per month ($60,000 USD annually). He also moved out of the presidential palace and into a smaller home, and committed to selling the presidential jet to recoup funds. With savings from government cuts in spending, President López Obrador seeks to invest funding into social programs, crime and violence prevention, “scholarships for students, pensions for the elderly, and infrastructure projects” in low-income areas, writes Reuters. Cortés, Nancy G., Octavio Rodríguez Ferreira and David A. Shirk. 2016 Justiciabarómetro – Perspectives on Mexico’s Criminal Justice System: What Do Its Operators Think? San Diego, CA: Justice in Mexico, 2017. Associated Press. “Mexico’s president-elect Amlo to take 60% pay cut in austerity push.” The Guardian. July 16, 2018. “Mexico president-elect hails passage of public sector pay cuts.” Reuters. September 14, 2018. “Corte Suprema México acepta bajarse sueldo, como pedía AMLO.” El Economísta. January 8, 2019. “Mexico’s Supreme Court agrees to lower salaries after spat.” The Associated Press. January 8, 2018. Morales, Alberto and Misael Zavala. “Una ‘buena decisión’, que Ministros se bajaran el sueldo en 25%: AMLO.” El Universal. January 9, 2019. “Today in Latin America: North America: Mexico.” Latin America News Dispatch. January 10, 2019. This entry was posted in Judicial Reform. Bookmark the permalink.